Deloitte in New Zealand have over 900 employees providing a broad range of professional services including audit, tax, risk management, accounting and business advisory services. Hundreds of confidential financial fax documents exchange hands daily, generated from five physical locations. Dozens of fax machines handled bank statements, audit data, legal files and more. 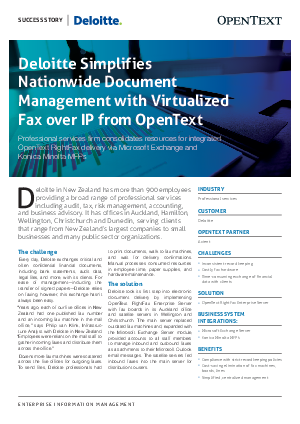 By implementing the OpenText RightFax Enterprise Server solution with the expanded Microsoft Exchange Server Module they were able to manage the inbound and outbound faxes as attachments to their Outlook email messages. This enabled Deloitte to leverage existing resources and track communications while eliminating costly hardware, simplify document management and enhance disaster recovery.